The hypothalamus coordinates various physiological processes, including food intake and energy expenditure, that are essential for energy homeostasis. Alterations in hypothalamic pathways disrupt energy balance, resulting in extreme body weight alterations. A lack of access to human hypothalamic neurons has hampered in depth evaluation of the neuro-molecular mechanisms that lead to metabolic phenotypes, such as obesity. Liheng Wang and colleagues at Columbia University developed a protocol for efficient generation of human hypothalamic-like neurons from embryonic stem cells (ESC) and induced pluripotent stem cells (iPSC) obtained from both healthy individuals and patients with monogenic forms of obesity. Human ESCs were successfully converted into NKX2.1+ hypothalamic progenitors through early activation of sonic hedgehog signaling plus dual inhibition of SMADs, followed by inhibition of NOTCH signaling. RNA-seq analysis confirmed that the differentiated cells express a hypothalamic transcriptional profile. Importantly, biochemical analysis revealed that these hypothalamic-like neurons were able to sense and respond to the metabolic hormones such as insulin and leptin. The results of this study provide a resource for further evaluation of hypothalamic-pathways in the control of human body weight. 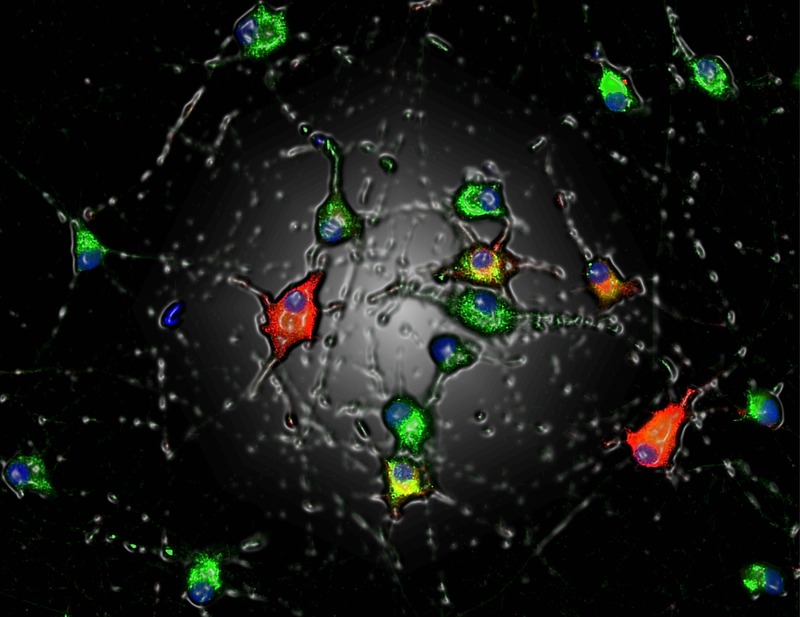 The accompanying image shows hypothalamic neurons that were differentiated from human pluripotent stem cells. These cells express neuropeptides that are relevant for body weight homeostasis, including POMC (red) and NPY (green). Nuclei are stained blue with hoechst.